Argentina vs Switzerland. If the Swiss pick Ponderous and Djourou as their central defenders this could get very nasty. Given the outstanding attacking talent of Argentina they should stroll this game but I thought that of Germany! The Argies haven’t hit their straps as yet but they have such a superb side they surely must at some stage in the competition. The Swiss rarely beat Argentina but with Drmic and Shaqiri they have a glimmer of a chance. This is likely to be Ottmar Hitzfeld’s last game – fine manager, good haircut. Belgium vs USA: I think this is a very interesting game. Belgium have individual skill in abundance but have yet to display real teamwork whereas USA,USA,USA are the opposite – no-one stands out but they work for each other like billy-ho (bet you haven’t seen that expression for sometime!). Dempsey’s face is getting re-arranged as the tournament progresses, black eyes, wobbly nose, staring eyes. USA have a hippy in midfield which I like – it is easy to imagine having a toke at half-time instead of an orange slice. The USA fans have been great with Klinsmann finally finding a way to introduce football (not effing soccer) to the Yanks, even Obama is watching! On paper this should be a Belgium win. The introduction of Fellaini has given them a focus and Hazard is improving. It was horrible to see Vermælen hobbling out – what an awful season he has suffered – and with Kompany struggling for fitness there could be defensive problems. Goalscoring has been a problem for both teams, could be tight. The first thing to know about the Sagna Conundrum is that it does not involve Bacary Sagna. The Sagna Conundrum is a problem created not by his presence, but by his absence, and it comes down to this: when our super-consistent French right back is not available, who should take his place? It’s a pressing question, given that Sagna will not be ready for the start of the new season. The principal contenders to take his place are Carl Jenkinson, Johan Djourou, Francis Coquelin and Laurent Koscielny. Last season, due to Bacary’s injuries, they all got a number of games at right back. The conventional wisdom is that Djourou was a disaster and Jenkinson, despite showing some promise, was out of his depth; but that both Coquelin and Koscielny proved to be adequate stand-ins. My own view – based primarily on memory of past performances – is that central defenders do not make good full backs because the FB role requires so much more mobility than they are used to. I prefer midfielders to step in if we are out of orthodox (or experienced) full backs. From my recollection, Coquelin and Jenkinson filled in well, but the two centre backs – Koscielny and Djourou – struggled. Memory, however, can be an unreliable guide, so I decided to take a more detailed look at how the four contenders fared when they stood in for Sagna last season. Djourou: 1.16 Pts Per Game (with an average 1.45 Goals Conceded Per Game). Jenkinson: 1.86 PPG (1.86 GCPG). Coquelin: 2.6 PPG (1.0 GCPG). Koscielny: 2.57 PPG (0.86 GCPG). Like all such studies, there are inherent problems with drawing conclusions from these figures. For example, if you look at Jenkinson’s “Goals Against” you would think him a liability. But eight of those goals were up at Old Trafford, when the lad had hardly ever worn an Arsenal shirt in anger and in a catastrophically weakened and confused team. Similarly, although Djourou’s stats look the worst, they include two games against the eventual league champions, one against Chelsea and one against Manchester United, as well as a dead rubber ECL game at Olympiakos where a partly second string Arsenal team lost 3-1. Nevertheless, I feel there is enough evidence to show that our big Swiss fellow is not cut out to be a right back. Indeed, when he was hauled off at half time in the home game against Manchester United (and replaced by the embryonic Yennaris) it may well have been a sign that Arsene Wenger had finally come to that same conclusion himself. I doubt we will ever see Djourou in that position again. Jenkinson’s stats look a lot better if you remove the Man Utd away game from the mix (and he can hardly be blamed for that collective fiasco). He then has a Points Per Game average of 2.16 and a Goals Against of 0.83. Surprisingly – and contrary to my recollection – Koscielny’s record as a right back is very good. I recalled him seeming to struggle, but the figures prove otherwise. His three-and-a-half games included two “easier” fixtures (Norwich away, Wigan at home) but also one-and-a-half tough ones (Dortmund at home and Manchester City away). Conclusions: For me, the table above is generally encouraging because it shows we can expect a solid performance from any of Jenkinson, Coquelin and Koscielny when they are compelled to play right back. I am happy with Djourou in the mix as one of our centre backs, but he does not function well at full back and, hopefully, we have seen the last of him in that position. I mentioned Yennaris earlier. Last season he took the right back spot in a Carling Cup game (2-1 home win over Bolton) and in the second half against Man Utd at the Emirates. According to those who have been watching our pre-season friendlies he seems to be showing promise. With Jenkinson and Yennaris maturing, we may well soon find ourselves in a position where playing other players out of position at full back is a thing of the past. Anyway, enough of my waffle. Do you think the table has merit? Does it tally with the evidence of your eyes? Are we sufficiently covered within the squad for the right back position or do you feel we should be looking to sign someone? *Before the eggheads among you start quibbling with my maths, I made certain adjustments to allow for the half games (for example, if we conceded a goal during a half in which Djourou did not play, even though he played in the other half, I have not marked down that goal in his “Goals Against” column. No team has won the Premier League without a centre half. Can a team win the prem without one? What’s the difference between a centre half and a central defender? Is it only a case of different names for the same position? Am I engaged in nothing more than semantics? Are there actual differences in playing styles? And if so from where does the difference arise? In the land where football began the defensive back line consists of full backs and centre halves, or centre backs, on the near continent those playing in the traditional centre half position are known as central defenders. Now is this just a case of you say “tomato” (American accented) I say tomato (English accented)? My summation is “No” its not only a serious question it goes to the very heart of why our defence has been so leaky, and moreover its at the core of why we haven’t gotten our hands on any of home made silver wear recently. I’d go even further and state until we have a centre half in the back line winning any of the 3 home grown competitions may prove to be beyond us. Why do I say this? Well………..
Football on the near continent is primarily played full square on the ground. The leagues of real significance as we all know are in descending order The Spanish, Italian and German. That’s not to say the others aren’t important, we as a club for example have imported widely from outside of these three biggies. France, Holland and Belgium have served us very well with their player offerings. Of the three big European leagues only the German league has any form of aerial bombardment included in its play and even that doesn’t compare with the type of play so often seen in the premier league. In Europe the English Premier League is seen by many Europeans as the most exciting league to watch, with its fast paced all action helter-skelter style, but the league is also seen by many of the same, as the least tactically aware. The kick and rush style with long balls played over the top isn’t a tactic you’ll come across on the continent, and as stated above the type of aerial bombardment that’s common place in Britain is not elsewhere. So this is where the divide begins. A typical centre half in Britain is raised with this style of play and has developed a way of dealing with it which differs greatly from a typical European central defender. What’s the difference? To answer this question I want to go back to our last great league winning defence. It wasn’t inherited as some of the uninformed like to put forward, it was built by Arsene. It contained the recently retired Sol Campbell. A more typical no nonsense centre half I submit it would be hard to find. What was the secret of this defence? Sol’s Head! Play a ball in over the top and Sol would beat whoever its intended target was and “head” it back where it came from. Fire a ball into the area from a set piece and rest assured if the keeper didn’t catch it Sol would “head” it away and out of the danger zone. I lost count how many times this would happen in games. It’s actually in the manor that a CH will move forward and attack the ball that significantly shows the difference in approach between the two types of player fulfilling the same role. CD’s instead of moving forward to attack a ball will wait stationary, or move back to give themselves room to bring the ball under control. What does a typical central defender do that’s so different? European central defenders have developed a style of play to deal with long balls played over the top. Their natural instinct is to allow the ball to drop to the ground and immediately bring it under control, and play it out from the back turning defence into attack. What’s wrong with that I hear everyone ask? Nothing! Absolutely nothing! Except in the fast paced rough and tumble of the premier league as the typical CD lets the ball drop he’s liable to have one or two of the opposition all over him like a rash. Which if its inside his own area is very dangerous and so makes playing the ball out from the back very difficult, our centre halves are raised with the idea that if the ball lands at your feet the best way to play it out from the back is launch it into row “Z”. You see teams who play long balls over the top (think of everyone favourite Stoke) tend to rush forward and crowd the box. It’s also often been a strategy successfully employed by Taggart & Co especially in the last 15 minuets when they are either behind or desperate to force a win. Bringing up the infamous Taggart aka Sir Alex Ferguson reminds me to add a caveat. Are there any Grey areas in this Centre Half Central Defender divide? As with most things in life there most certainly are as illustrated by an ex charge of Taggart’s Jaap Stam. A central defender who played more like a centre half than most centre halves, JS as a player wasn’t particularly mobile and certainly couldn’t be called quick, but he was very strong and determined and he read the game well, and he had that trait that a centre half just has to have “A head” and Jaap Stam headed more balls away from Man U box in the 3 short years he was with them than anyone else. This brings up a further observation why did the Campbell Toure partnership work so well? If a CH is so important why not have two? Well let’s look at how the partnership worked. A long ball gets punted up field towards a target man normally a centre forward whose job it is to nod it down into the path of an on rushing midfielder or attempt to bring it under control and hold it up while reinforcements arrive. As it’s in flight and on its way Sol sees the danger and jumps in sync with the striker. Now either he wins it out right in which case the ball is on its way back where it came from or he misses it but with Sol’s help so does the striker. If they both miss it behind them as the ball drops to the ground Kolo T mops up. Again I can’t even begin to calculate how often this sequence took place, but if we could bring up those stats I’d hazard easily more than 10 times per game. After going 49 games unbeaten with this defensive system why wasn’t it continued? It was! I think most of the top teams analysed how and why Arsenal had been so successful and emulated the formula. I think we as a club were the only ones who didn’t; perhaps we were too close to the action. I’d say our system was most successfully copied by everybody’s favourite player of the moment John (I isn’t a racist is I Cashley) Terry and his defencive partner Ricardo Carvalho at Chelsea. Taggart successfully employed the Ferdinand Vidic model. While most recently the CH CD combo was still being work by Lescott and Toure (again). Why wasn’t it continued at Arsenal? Well Sol left for Portsmouth under strange circumstances i.e. his “Head” wasn’t on straight? Too much pressure, or whatever, and we’d ended up with William Gallas by default as a result of the Cashley Cole affair. In other words without much analysis we went with what was available to us. The upshot of which was we suddenly had two European style central defenders in our back line and were without a centre half for the very first time, in our clubs history. The rest as they say is history! We had one of the least effective defences in the league. Without realising it, or even meaning to Arsene had proved a point about two CD’s and the Premier League. Many said the previously oh so dependable Toure just couldn’t play with Gallas. Not exactly true, played together on Tuesday or Wednesday nights in the CL they were fine, but the combination didn’t work for the Prem. How could it? Without a centre half to relieve the pressure on both the keeper and the defence in general our defence was suddenly under the microscope. If the keeper couldn’t replicate “safe hands” Seaman and collect high balls we would be pressured into conceding, and we were. We became the team that couldn’t defend set pieces and that perception lasted until very recently. In point of fact I don’t think we are particularly strong on set pieces even now. We did have a respite though when for a short period our defence was bolstered by the returning old Mr Campbell. In that short interlude our leaky bucket defence became almost water tight again, and I looked forward to the following season, knowing once again we might have a chance at the title, fate however would cruelly intervene. Sulzeer Jeremiah fell for and married a Geordie Lass and moved north so she could stay near her roots. (Love will do funny things to a man) I blame that bloody Woman! She probably cost us the title. Mind you I blame my wonderful “better half” whenever I can’t find a pair of socks or a clean shirt. Yes I admit it I’m a dinosaur. What’s to be done? Well…………First off try to remember that successful centre halves or successful central defenders come in pairs, so partnerships have to be formed. Next up a very quick analysis of our current defenders. (With the centre half central defender debate firmly in mind). 1) Let me start at the furthest end of the spectrum by saying there are in the words of the song “reasons to be cheerful”. We now have for the very first time in an age a proper British style centre half in the squad. Step forward Kyle Bartley, he may well be only a prospect but at least we’ve got one. Why am I happy about this? Well I’ve followed KB’s progress and as this article expounds I’ve wanted a CH back in our squad for an age. I’ve wanted KB to be promoted into the first team for an age. He might be unproven in the Prem but at least we’ve got him. I hope he can be paired up! 2) I want to continue with the much maligned Johan Djourou. JD is a little bit of a hybrid he’s neither a centre half nor a typical central defender. That might be because he’s Swiss? I honestly haven’t seen enough Swiss football to know if there are any reasons for a player to develop CH tendency’s in the Swiss league. He can and does do a bit of both. When partnered with Le Kosh he immediately played more of a CH role heading everything he could. JD was a successful defender for us, as the stats show when he wasn’t played out of position and partnered correctly. Every team needs 4 CH/CD’s and I’ll be saddened if he goes although like RvP his injury record reads like a hospital casualty department list. 3) I’m choosing Vermaelen next simply because like JD is a bit of a hybrid and KB apart the closest we have to a CH he attacks the ball in the manor of a CH certainly not like a CD. You find TV5 running forward to jump and meet an incoming ball in the manor of a CH. However he also plays in the typical CD style by playing out from the back, which probably comes from his Ajax background. When fit he’s probably currently our first choice centre back. 4) Laurent Koscielny is the most typical Euro style CD we have and he is probably the best CD any of us have seen at the club. His intercepting skills are a joy to watch and if he had a CH of the quality of our dear old Sol partnering him we’d probably have the best defence in the prem. That’s how highly I rate him. 5) The BFG? I just don’t know I haven’t seen enough of him in an Arsenal shirt to really make a judgement. He’s not a CH and he seems to be a one off CD.For a big man I’m yet to see him attack an incoming high ball. He’s worryingly slow for a modern day CD because since the changes took place to the off-side rule (Passive – Active – 1st phase 2nd phase). Neither Tony Adams nor Bouldie would be deemed quick enough and the BFG’s slower than them. He does have some admirable qualities as a defender though, he’s bloody big, strong and therefore intimidating and he reads the game well and it seems he can marshal the other defenders. For me the jury’s still out. What can we conclude from the last 9 games? In my opinion we can say without doubt that the defence has done some hard work on the training ground and it is a solid defence that wins games. Look at the stats. Last 9 games – 6 goals conceded. Previous 9 games – 15 goals conceded. Our first 9 games saw us concede 17 times! Yes, we may well score outrageous goals and huge quantities of them but it is self-evident that if we don’t concede we get at least a point. This is the SAF way, his philosophy has always been to set out a team with a solid base and allow the flair players to work from that base. George Graham was a man who fully understood this. Sure, we saw some absolutely dire football but “1-0 to the Arsenal” was a song I sung with as much gusto as “Living in a Bergkamp Wonderland,” though I remember the DB wonder goals far better than the 1-0 bores of the GG years ….. apart from that magic night in Copenhagen when the defensive genius of Graham’s management was in full flower. What has changed? The obvious answer is the return of the full backs. Any team would struggle with 4 FB injuries, and the loss of Sagna in particular was very costly (I have to admit to having a man crush on Bacary). But how does the return of the FB’s explain our new found ability to defend set plays? It has to come from improved organisation, and that must come from hours of practice. 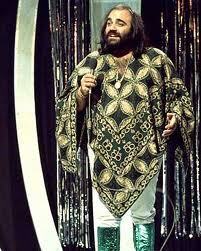 And who at the club knows all about defensive co-ordination? Yes, …. 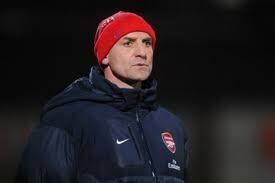 “he’s got no hair, but we don’t care” Steve Bould. Could it be that Bouldy has at last got to grips with the defence or is it someone within the team? BFG or TV? Or is it having a goalkeeper who has grown into the shirt and is prepared to dominate his area? Whatever the reason, in recent weeks we have conceded from either bad luck (loss of footing) or a momentary lack of concentration (QPR). And can you really say which is our best back line? The only player I would say is an automatic starter is Sagna, TV and Kos could be rotated with BFG, who in my opinion is the best organiser, and the jury is out on Gibbs or Santos. Gibbs has been troubled by niggly injuries and though he is undoubtedly our future first choice LB, it is to AW’s merit that he signed Santos to nurse Gibbs through. A run of games will show what a fine player the Brazilian is. The ankle injury to Mertescker is a cause for concern. When I first read of the Vertonghen rumors I dismissed them but two serious injuries to the same ankle could be evidence of a skeletal weakness in BFG – I sincerely hope not as he and Kos were developing a fine partnership. Which brings us to Arsenal’s most improved player of the season. Koscielny showed glimpses of his talent last year but this year he has been fantastic. Dependable, creative, pacy, good in the air. Another Wenger gem. After the wonderful defences marshalled by Adams and then Campbell, have we at last a back 5 we can depend upon? A real 3 pointer today, what with Spurs and Liverpool dropping points at home. We all know that Swansea are a very difficult side to beat at the Liberty Stadium, in fact only MU have won there this season. The Swans have conceded just 4 goals at home (compared to AFC’s 6) and have drawn half their home games (5/10) Spurs gained a very squeaky point a couple of weeks ago and Swansea will go into the game full of confidence. Beating Swansea at THOF was our first victory of the season, it was back when we were awful , only a first half Arshavin goal securing the points. It is testament to Swansea that we should consider this fixture as “tough” – who would have thought so when Swansea were promoted? Most AFC pundits would be happy to leave Wales with a point, but if we are to push for an automatic CL place we must have higher ambitions. Remember how to do this Andrei? Our lack of full backs has disrupted the team of recent weeks and any manager worth his salt will target our flanks; 26% of Swansea passes go out to the right wing and in Scott Sinclair and Routledge they have players who can cause us problems, though it could be worse – they could use the left flank 🙂 Dare we go into the game with Miquel and JD as our full backs or would we be better served by playing Squillaci in the centre and moving Koscielny to the left? Midfield is where today’s game will be won, Song is a hugely important and should he regain his form we will have the platform to win. Apart from the super pass to TH on Monday (still feeling the elation?) Song has not been playing up his very high standards, his passing haas been shaky and he doesn’t seem to know what his exact role is in midfield – is he a link player, a DM or an attacking midfielder? Fluidity amongst ARS is all well and good but sometimes it doesn’t gel. Henry, Benayoun or Ashavin to replace Gervinho? I would select Arshavin who really tried hard on Monday and bring on TH after 70 mins. Can you remember the last time Meerkat played a full game? Interesting stats: We have conceded in all bar 2 of our last 17 away games. We have had 9 shots cleared off the line – the highest in the PL. Only 14% of our goals have been scored from set pieces – the lowest in the PL. We have a very strong bench (apart from GK). Benayoun, The Ox, Henry, Rosicky, Squillaci or Yennaris. Inventor from Swansea? 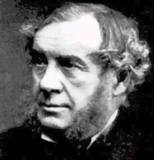 Sir William Grove. Not only a High Court Judge but also the inventor of the fuel cell which is still used today in space rockets. Sir William is one of The 100 Welsh Heroes. Of course, Swansea is better known for giving birth to stars of the Arts including, amongst a wealth of others, Dylan Thomas, Anthony Hopkins, Sir Richard Burton and the great Bonnie Tyler. Can the return of Thierry fire up the team? Today will be a test as Swansea are on a fine run of form and we are not. Toothless sans RvP we have to find more goals from midfield. A tingling in my fingers is telling me Ramsey will score today on his return to his homeland. To lose all four of our first team fullbacks at once to long-term injuries really is unfortunate. As an example of serious bad luck it’s right up there with Wayne Rooney finding himself at Grab-a-Granny night in the local nightclub with both arms in plaster; or Harry Redknapp taking a wrong turn into an auction house and accidentally winning 53 bids on account of his twitch. Despite our spirited performance at the PetroDome on Sunday, Manchester City shaded the game and just about deserved the win. However, I am sure that if we had had recognised fullbacks instead of converted centre halves the balance of play would have been much more level and may even have tipped in our favour. There seems to be some possibility of Gibbs returning in time for the Boxing Day fixture against Wolves at the Emirates, but that’s far from certain and the other three (Sagna, Santos and Jenkinson) are still a way off. To compound the problem, Johann Djourou, who has been filling in at right back, is also out injured for three weeks. The makeshift back four that finished the game against City did not look convincing. Quite apart from their inability to support our wide forwards, they also struggled positionally. I’m not blaming the individual players because they did their best while playing out of position, but Koscielny lost his bearings in the build-up to Silva’s goal, allowing Balotelli too much room, and Miquel, as temporary left back, should have been picking up Silva who was standing unmarked in the box. With the speed and intensity of Premiership football, you can only hope to eliminate those sorts of errors with constant drilling and practice as a fullback, which neither Kozzer nor Miquel has had the opportunity to do. On Wednesday we play Aston Villa and we need to find a solution to this conundrum. 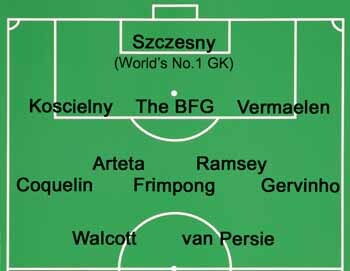 I would be disappointed if we start with a back four of Miquel and Kozzer as FBs and Vermaelen and BFG as CBs. We run the risk of having a groundhog day experience, with not enough support for the wide players and not enough positional discipline to make our defence as secure as it should be. Instead, and because these are special circumstances, maybe it’s time for Arsene Wenger to try something a little more radical. My suggestion? We adopt a 3-5-2 formation (or to avoid upsetting GiE and the goalkeepers’ union, a 1-3-5-2). My back three would be the Verminator on the left, BFG in the middle and Kozzer on the right. In front of them a five made up of (from left to right): Gervinho, Ramsey, Frimpong (Song is serving a 1 match suspension), Arteta, Coquelin. And, up front, Theo and RvP. I have moved Gerv into the five man midfield because he is more effective at covering defensively than Theo and also has more variety in his play when picking up the ball from deep. I like Coquelin as right midfield because he has played RB before and is a tenacious tackler and competitor who also has the footballing skills to bomb forward and help the attack. Arteta, Frimpong and Ramsey in the middle all have the energy and awareness to drop back if one of the two wide midfielders is caught forward. As for up front, I don’t see Prince Robin needing to change his approach at all, but I would give Theo licence to drift all along the attacking line without needing to overly concern himself with defensive duties. A hot sunny Athens morning, greek yoghurt, fresh fruit, and some Greek honey. Lovely. With little insight into the Greek team I will concentrate upon the Mighty Arsenal. Needless to say we go into the game reduced by injuries. To add to the long term absentees we now have Gervinho, Walcott, Bennie, Miquel, Djourou and more importantly Koscielny injured. Wenger appears to be forced into playing Song alongside the BFG (Mertesacker) but by doing so we lose our best midfielder. I would like to see Santos get another game tonight, he must be raring to get his AFC career started and despite having played well recently Gibbs, as we all know, is made of glass. Up front we have options for the first time in ages. Should we play 4-3-3 expect to see the Ox to get his first start and how exciting will that be? Arshavin or Ryo on the left? AA for me, we need to be on the front foot for this game. I have concerns about the number of games being played by Ramsey especially in light of the upcoming trip to WHL. Perhaps AW will give him a rest and play Coquelin and Frimpong in midfield, as it is I expect Frimpong to start. This is a game made for our friend Abou Diaby, he is sorely missed (IMO). The same could be said of Van Persie but he has become so important to the team that he must start, hopefully we will be a coasting on the hour and Chamakh can continue to get some pitch time. Athens has been continuously inhabited for more than 7000 years (London has a measly 2000 year history). Athenians and ancient Greeks have gifted the world many wonders, among them – democracy, astrology, biology, mathematics, physics and the theatre, but for all their marvels they didn’t invent football, did they?